HONG KONG: Asian markets were mixed on Wednesday, with attention focused on Washington as investors await the end of a Federal Reserve policy meeting to find out its plans for a huge stimulus programme. 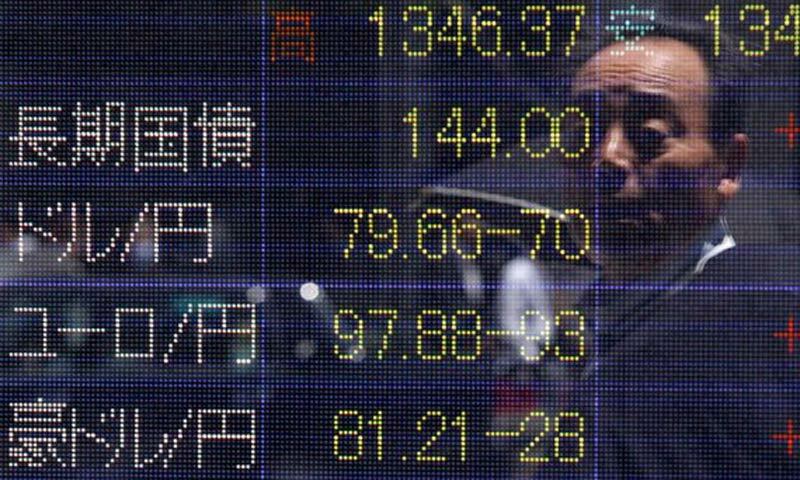 Japanese equities were the stand-out performers after official data showed a surge in exports thanks to a weaker yen. Tokyo rose 2.02 per cent, or 309.17 points, to 15,587.80, Sydney slipped 0.14 per cent, or 7.1 points, to 5,096.1 and Seoul ended 0.45 per cent, or 8.89 points, higher at 1,974.63. Shanghai lost 0.13 per cent, or 2.79 points, to close at 2,148.29 while Hong Kong added 0.32 per cent, or 74.59 points, to end at 23,143.82. Regional traders were given a soft lead from Wall Street, where the three main indexes ended lower following a tepid set of economic figures. With the Fed due to wrap up its two-day policy meeting later in the day, opinion is split on whether it will announce a cut in its $85 billion a month bond-buying scheme. While some analysts point to a string of figures that indicate a healthy pick-up in the US economy, boosting the argument for a slight reduction, others say the central bank will likely wait until early next year to see if the recovery can be sustained. �Wednesday's Federal Reserve monetary policy announcement is one of the most anticipated events of the year,� said Kathy Lien of BK Asset Management. John Kicklighter, chief currency strategist at DailyFX, said speculation about the Fed decision �has run rampant�. The latest numbers showed the economy is still fragile. Consumer prices were unchanged in November compared with October and up a tame 1.2 per cent from the previous year. Inflation remains well below the Fed's two per cent annual target. Income growth for Americans � a key indicator of the health of the economy � remained modest at 1.1 per cent year-on-year. The Dow edged a touch lower, the S&P 500 fell 0.31 per cent and the Nasdaq eased 0.14 per cent. On currency markets the dollar rose to 102.94 yen in early trade from 102.63 yen in New York late Tuesday. The euro bought $1.3767 and 141.74 yen against $1.3765 and 141.28 yen. Japanese shares outperformed the region after Tokyo released figures showing exports last month rose 18.4 per cent year-on-year, boosted by shipments of automobiles and a weaker yen. Expectations had been for a 17.3 per cent rise, according to Dow Jones Newswires. However, while the likes of Toyota and Sony benefited, the softer currency also sent the price of imports higher, especially for energy. The value of imports soared 21.1 per cent, leaving Tokyo with a trade deficit for the 17th straight month. Oil prices were mixed. New York's main contract, West Texas Intermediate for January delivery, was up 21 cents at $97.43 in afternoon trade while Brent North Sea crude for February rose eight cents to $108.52. Gold fetched $1,230.84 at 0810 GMT compared with $1,239.20 late Tuesday. � Taipei was flat, edging down 3.89 points to 8,349.04. Taiwan Semiconductor Manufacturing Co. fell 2.42 per cent to Tw$101.0 while Hon Hai rose 1.02 per cent to Tw$78.9. � Wellington gave up 0.10 per cent, or 52.14 points, to finish at 4,675.88. Fletcher Building was down 2.22 per cent at NZ$8.35, Air New Zealand shed 0.62 per cent to NZ$1.615 and Telecom slipped 1.29 per cent to NZ$2.29. � Manila gained 0.55 per cent, or 32.56 points, to 5,961.55.